Name: Experience Leadership and Team Development at Dashing W Farm! Want to know what our equine-assisted approach to leadership and team development for corporate groups is all about? Join us at Dashing W Farm in Opelousas on the afternoon of February 22 to find out. Bring your boots because this is not a passive demonstration! You will participate in activities with the horses and experience the transformative effects of our debrief sessions to learn how teams within your organization can enhance their leadership and team communication skills through the development of social capital - the trust, behavioral standards, and unwritten rules that influence team performance and lead to quality group interaction. We will also explain assessment options that we use in preparation for each workshop to ensure that your team has a meaningful experience. 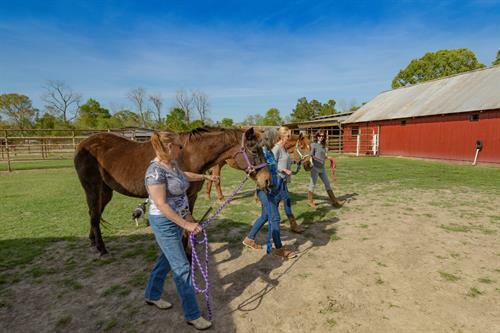 This is a great way for representatives from your organization to witness the impact of our equine-assisted learning approach before scheduling a full day workshop.